“The gains made by Jobbik, an unashamedly neo-Nazi political party, should serve as a wake-up call for the whole of Europe,” said EJC President Moshe Kantor, according to the European Jewish Press (EJP). “Once again in Europe we are witnessing democracy being appropriated by those are the enemies of democracy. This is truly a dark day for Hungary,” he added. “It is the duty of both European leaders and voters to ensure that a strong message is delivered by supporters of democracy throughout Europe to show these racists and xenophobes that hate has no place on our continent,” said Kantor. Hungary's Prime Minister Viktor Orban scored a victory in Sunday’s election. With 99 percent of votes counted, Orban's Fidesz party was on 44.5 percent, far ahead of the fractious opposition centre-left alliance led by Attila Mesterhazy at 26.0 percent, according to AFP. Jobbik came in third and took a 20.5 percent share, up from 16.7 percent in the last election in 2010, the report said. 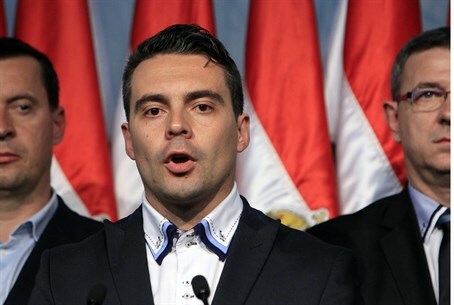 Jobbik, which calls itself a "radical nationalist" movement focused on law and order and attacking corruption, has been behind many of the anti-Semitic attacks in Hungary in recent years. Jobbik leader Gabor Vona said after Sunday’s elections that ahead of European elections next month, his party was the "most successful radical nationalist party in the European Union." "This confirms that honest politics bears fruit," he said.